The Default view settings tool in the Basic Editor is your one-stop-shop for adjusting the underlying settings in your Kumu map. Templates, layouts, default element and connection styles, and more can all be changed in this tool. You can find the Default view settings tool by clicking the Settings icon on the right side of your map, then clicking MORE OPTIONS and selecting Customize view defaults. The tool has up to six sections, depending on the template and layout you&apos;re using: Template settings, Element defaults, Connection defaults, Font defaults, Layout settings, and General settings. 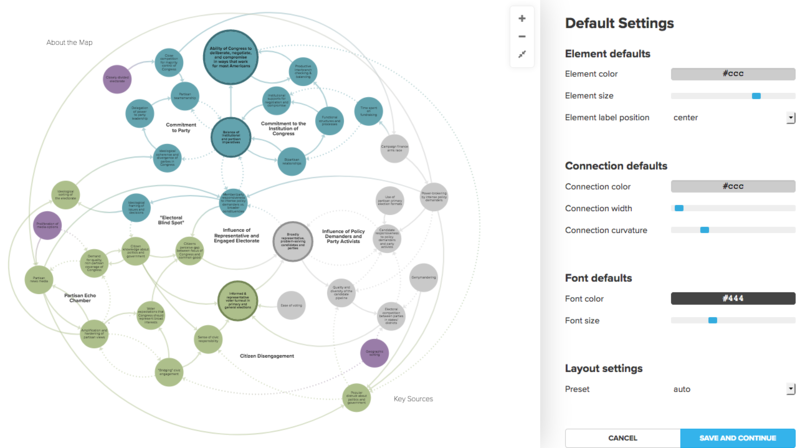 This section, which is only available for the systems, stock and flow, and causal loop templates, allows you to tweak things like same/opposite connection color, connection labels, and more. These three sections allow you to change colors, sizes, widths, and other styles for all your elements and connections. Font defaults will apply to loops, as well. Note that any decorations you have created will override your default settings. Layout settings are available when you are using the force-directed layout on your map. For more information on how to use this section, check out our full guide on the force-directed layout. The General settings section allows you change your theme, template, quality, and layout. Theme can be either light or dark. The dark theme is great for big screens in dark rooms! Template allows you to choose one of Kumu&apos;s pre-built templates. Quality can be either high or low/fast. High quality gives you full access to Kumu&apos;s suite of decorations, but it will run slowly on very large maps. Low/fast, on the other hand, restricts your access to different decorations, but it helps large maps to load and animate much more quickly. Layout allows you to choose between the fixed layout (select "off" from the dropdown) or force-directed layout.